on the 'thankfulness' aspect of this holiday--and not just the *wonderful* food. Thanking God today for every single one of my blessings, and even those things that may not seem like blessings right now! Me: "Cameron, it's not too cold outside. Why don't you get your coat on and go ride your bike in the driveway?" Me: "C'mon, buddy...it would be good to go outside and do something active for a while." Cameron, looking around--a.k.a., trying to come up with something to do--suddenly shouts: "I got it! I think I'm going to color. It's exercise for my arm." Are you the kind of person--like my amazing and very craft-talented Mother-in-Law--who spends hours making personal Christmas cards to send out? Or, do you take the easy road and just send the store bought kind--preferably, in all money-saving-consciousness, of course--purchased the day after Christmas the year before? Bet you can't guess which one yours truly is. If you said the first--I'm laughing in your face right now. I'd be that gal that goes on the hunt the day after Christmas, digs through heaps of unorganized, left-over cards, and finds the best ones she can--generally ones with some sort of verse on the inside, seeing that without the coming of Jesus, we'd have no Christmas card sending at all--and stock up on those for next year. This year, I am doing things differently--and I couldn't be more excited about it!! 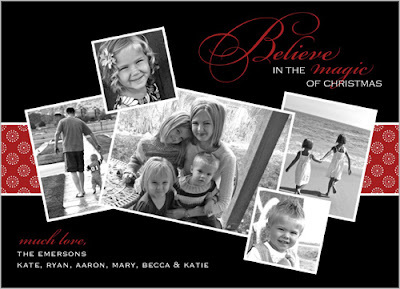 I've always dreamed of doing those fancy photo Christmas cards--like my sister-in-law Karie always does. I drool over hers every year and think, "Why don't I do that?" The answer is really, really simple. Cost. However, this year, Shutterfly--which is an amazing online photo company I have used in the past to make great photo calendars for family gifts--is treating bloggers (like myself) to 50 free Christmas cards! I am torn between a few designs. There tons of great ones to choose from--here are just a few I like. Um, are you kidding me? I love the simplicity of the black and white with the holiday colors. And, room for a family photo and four sweet head shots of each of my brood? LOVE it! No verse--but I supposed I could always write one on the inside. You could also choose a less expensive, flat option. 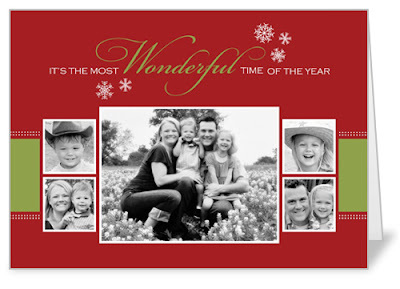 Though none of them really stood out to me, they do have religious Christmas card options as well. Basically, if you can think it, Shutterfly has it! 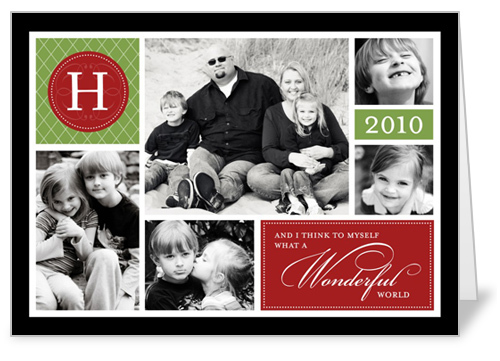 I can testify from past experience that Shutterfly is a great company with an easy to navigate site and great quality results. Try them for yourself. Happy Christmas card making! "Ethan! Ethan. It's like this: one plus one equals two. And, ten plus ten equals twenty. AND, "K" plus "K" equals "L"." "Ummm...I have to get used to it. It makes me shake a little bit." And I'm left wondering: did someone put something in our water today? Lola wants you to know that . . . In honor of the veterans . . . I woke up this morning and my boys had dressed themselves. Camo, guns, 'helmets'...it was all there. We've been talking a lot these past few days about the sacrifice of the soldiers--what they have done and given up for our country--and it was wonderful to wake up and and see that they had grasped Veteran's Day on their own level. So thankful today for the sacrifices of our servicemen and women! I would have never thought it possible at the time, but my love has grown leaps and bounds. Praising the Lord today, for 10 of the best years of my life...and looking forward to many more 'tens'. After duking out the championship soccer match on his birthday and grabbing a win, Colin came home to a smaller, different sort of celebration--his birthday party! But there were gifts involved, so party it was! Col got a few great things. He is really into the Bears this year, so we sort of spoiled him with that! Hey! A Bears backpack from Mommy and Daddy! And, I believe, his favorite of the day--a REAL jersey. The pictures show how much he loved this one! Oh, and the fact that he may or may not have worn this like 52 times since then. Oddly, when you ask Colin his favorite color these days, he responds with "turquoise". Turquoise? No idea on earth where that came from. ...and we're pretty sure he like that, too. It doesn't seem possible that God sent you to me over seven years ago, Colin, but I'm sure glad He did. I love you so much--Happy Birthday! !